Strange & unexplained thermal, electric, magnetic and gravity tremor activity has been reported detected by several of our sensing devices in known areas where psychic and paranormal phenomena is believed to be active. Below are devices that appear to detect some of this unexplained activity. Battery operated directional device detects sounds beyond the range of human hearing, with narrow band tuning from about 23 to 27 kHz, allowing you to hear and pinpoint mechanical, electrical and biological high-frequency sounds such as leaking gases, air, water; corona leakage; motor frictional sounds potentially including bearing wear breakdown noises; bats, insects, and other sounds of mother nature; a hunter's aid for high frequency sounds made by animals traveling through dry woods or even wet grass -- even beading water! There are countless applications for this unit. 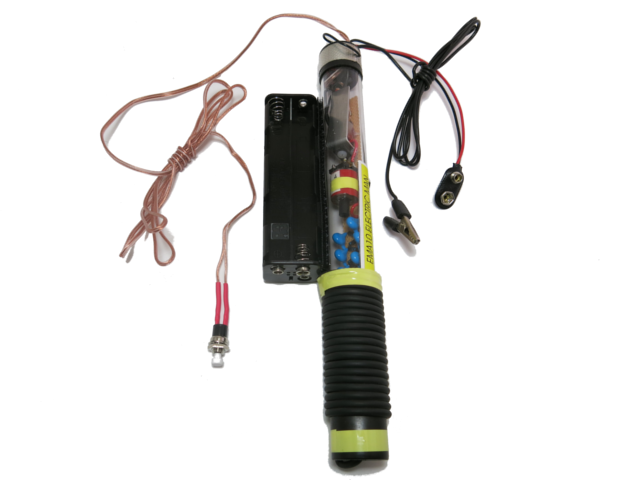 Battery operated directional device indicates small changes in the light levels often attributed to paranormal activities. Unit contains a sensitivity control, audible and visual alarms. Explore the amazing and mysterious phenomena where many objects produce a glowing electrical "AURA". Operates from 115VAC or batteries. Mystify and amaze your friends by creating motion with no known apparent means or cause. A neat electronic device that uses no direct electrical or mechanical connections, no special gimmicks, yet can produce motion and other effects. Excellent for science fair projects, magic shows, party demonstrations, to amaze & confound your friends, or even for serious research and development of this strange and amazing psychic phenomenon.